I would never claim that my search for the perfect iPhone 3G case has finished, I don’t think it ever will, but many cases have come close to perfection each in their own little way. I’ve looked primarily at leather cases, but there are some cases of other flavours in the pipeline for coverage, I’ve just got to get ’round to them! You might think that this particular offering from Proporta is yet another leather case, but the words “Leather Style” in its name allude to something else. The Leather Style iPhone 3G Case is, in fact, manufactured from a “high quality alternative to leather” making it absolutely, 100% cow free whilst maintaining that attractive executive leather styled finish. 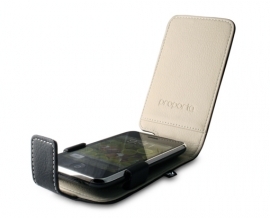 The Proporta Leather Style iPhone 3G Case uses a fetching two tone design that sees the inside of the case decked out in a striking beige which forms a perfect contrast alongside a black iPhone clamped firmly within. The outside is a traditional black which is interrupted by nothing but even and consistent white stitching. The clasp mechanism on this particular case is ingenious and, by far, my favourite out of all the many, many cases I have looked at. A simple flap of leather with a magnet sealed invisibly inside flaps over the bottom of the case and ’round to the front where a similar magnet holds it surprisingly securely in place. It’s a godsend not to have to fiddle with magnetic or mechanical poppers which sometimes require a little coaxing into place, you can quite simply just “flick” the magnetic flap closed. Once closed, the top flap is held far more securely than it needs to be, dispelling any fears that the iPhone might not be as well protected. In addition to opting for this minimal clasping mechanism to secure the front flap, Proporta have implemented their fairly common “clamp” method of holding the iPhone in place into the inside of the case. Three small, soft-coated, metal arms hold the iPhone 3G securely in place with as minimal surface contact as possible. This not only effortlessly shows off the iPhone in all its glory, but ensures easy and unobstructed access to all of the buttons and ports. A slight worry is the arm that stops the iPhone sliding out of the bottom. With nowhere much to go it opts to half cover the speaker outlet on the bottom. This is preferable to covering the microphone and should never really cause a problem when you’re using the iPhone as a phone or music player with headphones plugged in. It’ll dampen the sound ever so slightly in all other cases, however, so you might find it suboptimal. Personally, I’ve never had an issue with it but your mileage may vary. There’s very little else to say about this shining example of a case, the top flap has a welcomed corner cut-out so you can manouevere it around headphones without needing to unplug them and the cut-out for the camera, whilst not as nicely finished as other cases, lines up perfectly when the iPhone is seated correctly. The single most appealing feature to me? The minimalism, this particular iPhone 3G case lacks even a connector for a belt clip, leaving the outside completely unblemished by paraphernalia and 100% pocket friendly. If you want one of the best looking and most iPhone complimentary cases around, then this is it. This entry was posted on Tuesday, February 3rd, 2009 and is filed under iPhone.